Habitat : Cultivated all over india upto 5000 m and in many other temperate and warm countries. Uses : The plant is used in the treatment of intestinal parasites, though the part of the plant used is not specified. The leaves, seeds and old roots are used in the treatment of asthma and other chest complaints. The juice of the fresh leaves is diuretic and laxative. The seed is carminative, diuretic, expectorant, laxative and stomachic. It is taken internally in the treatment of indigestion, abdominal bloating, wind, acid regurgitation, diarrhoea and bronchitis. The root is antiscorbutic, antispasmodic, astringent, cholagogue, digestive and diuretic. It is crushed and used as a poultice for burns, bruises and smelly feet. Radishes are also an excellent food remedy for stone, gravel and scorbutic conditions. The plant contains raphanin, which is antibacterial and antifungal. 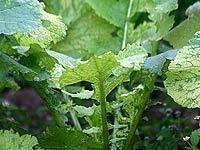 Radish preparations are useful in liver and gall bladder troubles. The roots are said to be useful in urinary complaints, piles and in gastrodynia.